The Delta Lowlands, a place of stunning innovation and creativity in music and film, has laid an incredible foundation for American entertainment. Talented singers, producers, and musicians from a narrow stretch of Arkansas Delta land—traversing U.S. Highway 65 south near England down to Pine Bluff and on through Lake Village/Eudora—have garnered every conceivable distinction, including Grammys as well as Country Music Association (CMA), Gospel Music Association (GMA), Stellar, Dove, Soul Train, Rock and Roll Hall of Fame, and other music awards. The mosaic of cotton blossoms, catfish farms, blues juke joints, foot-stomping churches, and rich Delta dirt has also served as the training ground for legends in blues, R&B/soul, country music, jazz, and gospel. In film and television, the Delta Lowlands has birthed the invention of sound in movies, the development of slow-motion footage, the creation of television's Neilson's ratings, the first western-genre movie star, a cadre of Emmy and Oscar award–winning personalities, and a television tower that was once the second tallest man-made structure in the world. 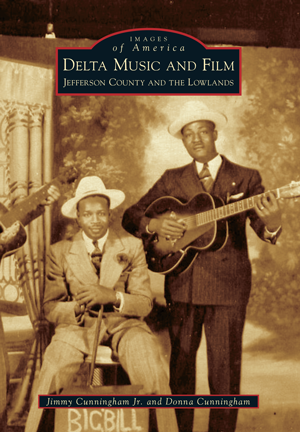 In Images of America: Delta Music and Film: Jefferson County and the Lowlands, authors and longtime area residents Jimmy Cunningham Jr. and Donna Cunningham unite to present a previously untold, yet unforgettable, odyssey of Delta genius, creativity, and talent.